Scott Wedgewood, who left near the midway point of Saturday’s game at St. John’s, was on the ice for the Albany Devils practice Tuesday at Knickebacker Ice Arena. The 22-year-old was sidelined during a scramble in front. After the play moved into the corner, Wedgewood returned to his feet, favoring his upper-left side. Wedgewood made 11 saves during the first 31:52 and Scott Clemmensen had 17 stops in the final 28:08. The shutout was Albany third of the season and first combined shutout since Feb. 8, 2014. 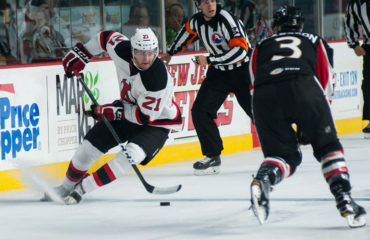 During that game, Wedgewood and Keith Kinkaid helped the Devils to a 3‐0 win at Bridgeport. Kinkaid started the game and had 16 saves in 38:41 and Wedgewood followed with 12 stops in 21:12. This season Wedgewood is 9-12-5 with a 2.97 goals-against average and a .896 save percentage. Clemmensen is 5-8-2 with a 2.62 goals-against mark and a .904 save percentage.